I originally posted this on Reddit almost a year ago (it was the first time I had tried my hand at this kind of thing), but wanted to give it a spot here. Considering investigators have audio and a photo of the perp, this case is totally solvable and keeping it in the media is an important factor in catching whoever committed this truly awful crime. Around 1:00 PM on February 13, 2017, 13-year-old Abigail Williams and 14-year-old Liberty German are dropped off at a Delphi Historic Trail trailhead in Delphi, IN by a family member. The girls were off school that day due to an unused snow day. 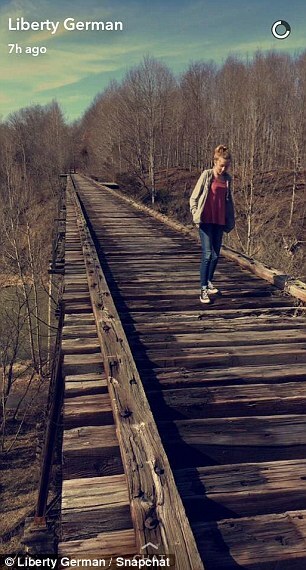 Around 2:00 PM, Liberty uploads a photo of Abigail to her Snapchat app indicating that the girls are walking on the Monon High Bridge. At 3:00-3:30 PM, the family member who dropped the girls off at the trailhead returns to pick them up, but cannot not find the girls. Around 5:30 PM, Abigail and liberty are reported missing to the Carroll County Sheriff. A search of the area was conducted that same evening, but was called off due to darkness. The Carroll County Sheriff says in a statement that there is “no reason to suspect foul play”. The following morning, February 14, 2017, the search resumes with K-9 units, dive teams and the FBI now participating. Around noon, members of the search party find two bodies on private property abutting the trail area. The bodies are not identified to the public, but Indiana State Police Sgt. Kim Riley states to the press, based “on the way the bodies were found”, foul play is suspected. Autopsies are conducted on the two bodies the morning of February 15. That afternoon, the Indiana State Police and Carroll County Sheriff hold a news conference where they confirm that the bodies discovered the previous day are those of Abigail Williams and Liberty German, and that they are now conducting a double homicide investigation. They do not report how the girls died, citing respect for the families and the ongoing investigation. That same day, the Indiana State Police also release a photograph of a man who was reportedly walking the same trail as the girls the day they went missing, but they do not state where the photograph came from. 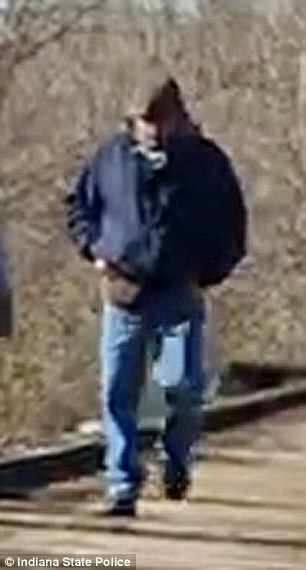 The State Police do not identify the man in the photo as a suspect, but do say they want to talk to him. On February 22, the Delphi Police Department, the Carroll County Sheriff, the Indiana State Police, and the FBI hold a joint press conference. Police now say the man in the photograph, released to the public on 2/14, is considered a suspect in the deaths of Abigail and Liberty. Shockingly, the police state that the photograph was taken from video that Liberty had recorded on her phone. An audio clip is played at the press conference, reportedly also taken from video that Liberty had taken. A male voice can be heard saying “down the hill” in the clip, during what police identified as “criminal activity”. Police do not confirm that the voice in the audio file is that of the man in the photograph. Police note Liberty’s “presence of mind” to begin recording this individual and call her a hero. It should be noted that the owner of the property that the girl’s bodies were found on, Ronald Logan, has been arrested but for an unrelated offense (violating terms of his parole). The rest of this post will mostly be IMO. I believe that this crime was committed by a single individual, a stranger to the girls, probably someone with a drifter type of lifestyle. If a person from the area had committed these crimes, I think there would have been earlier, similar crimes in the surrounding area such as rapes or even murder. But there weren’t. The suspect in these crimes was able to intimidate and control two teen girls by himself (I’ll get to why I don’t believe there was a second perp in a moment) and to me that indicates a degree of sophistication that you don’t get with a first-time offender. It’s been said that the suspect must have significant knowledge of the area to have gotten the girls to where their bodies were eventually discovered, but I don’t think that’s necessarily true. If you look at the map I linked, the bodies were found within walking distance of the presumed abduction site (Monon High Bridge), along the creek. He could have forced the girls off the bridge and walked them along the path of the creek until they arrived at a spot he thought was isolated enough to commit the crime. I think the location of the girls’ bodies on private property is likely moot, I haven’t heard any reports that the property line was marked or fenced off in any way. I could be wrong, searchers reportedly followed footsteps to find the girls bodies, but info on the path of footsteps has not been released so I’m sticking with my theory for now. Even then, it’s possible that the perp had some knowledge of the area. As I stated previously, I think this guy may have been a drifter of some sort and has committed crimes in other places. It’s possible he has camped out in forested areas on his travels, sleeping in a car or tent if he has one. If he is a repeat offender, he may travel between several “hunting ground” areas such as the Delphi trails and thus would know a bit about the area. With the information that’s been released, photo and audio file, if this guy was local/knew these girls, I’m sure he would have been identified already. Delphi is a small town and we’re almost 2 months out from the date the crime occurred. The case has State Police, FBI and Dept. of Homeland Security involvement and DNA evidence was found at the scene, if there were a local/personal link I believe they would have discovered that information by now. There have been some rumors that one of the girls was catfished and lured out to the bridge by the perp, but police have said there’s no evidence of that and with the technical resources at their disposal, they’ve likely explored all the social media avenues by now. Police noted Liberty’s “presence of mind” to start recording the suspect on her phone. To me, this language indicates that Liberty was spooked or suspicious enough that she felt she needed to record this guy. If this were someone she or Abigail knew, why would she feel she needed to record him? Stranger killings are the hardest to solve, and I think the information that has been released at this time point towards that being what happened. I think this was committed by a single assailant, mainly because I don’t see why the police wouldn’t tell us otherwise. Although the police did not confirm at the press conference that the audio clip was from the man photographed, I think that is because once Liberty had started recording on her phone she probably slipped it into her pocket while it continued recording. Police said the audio file was recorded during “criminal activity” so it was probably audio isolated from the perp speaking to the girls after they were already under his control. If this is the case, police cannot publicly confirm that the audio and photograph are of the same person, since video probably only shows the inside of Liberty’s pocket. It’s probable, to my thinking, that much more of the crime was also recorded, and if a second perp’s voice was found on there the police have not released that information. I think the suspect in the photograph was walking the trails that day, hunting for a teen or young woman to sexually assault and murder. He spotted the girls at some point after they were dropped off and began stalking them. In the picture of the perp, his jacket looks to me as if it is bulging outward. I think he may have concealed a weapon (gun is most likely, here’s a photo I sourced from Websleuths showing what looks like the outline of a gun) and perhaps a rope or cord in the front of his jacket. Once he was confident the area was clear enough of potential witnesses, he approached the girls and threatened them with a weapon. Then he herded them off the bridge. The girls were young, still young enough and terrified that I think they would be easily intimidated and compliant with an adult threatening them. Once the perp had the girls under the bridge, he marched them along the creek until he found a spot he thought was isolated enough to commit the crimes. He probably tied one of the girls up with rope or cord he had brought along while he assaulted and killed one girl, then he assaulted and killed the other one. No gunshots were reported that day, or screaming so I am guessing he strangled them. There was a heavy police presence at a cemetery directly north of where the bodies were found. This cemetery sits right next to a road (W 300 N), which if followed west would lead back to the trailhead drop-off location where the girls were last seen. Police, at the press conference on February 22, asked for people to call with any tips of a man seen hitchhiking or walking down roads in the area. I believe the perp walked north through the woods, through the cemetery, and then followed the road back to the trailhead. He then probably got in his car and left town immediately. This case is so sad and I can’t imagine the terror these girls felt that day. I think this case is absolutely solvable, it just needs the right person to hear the audio and see the photograph that Liberty bravely took.